Metta World Peace, Chad Ochocinco, World B. Free, and Mark Super Duper! A couple of years ago, one Ron Artest decided he was going to change his name. Ron Artest might not be a name you recognize unless you watch or are a fan of basketball (NBA). Artest has played for 5 NBA teams (Chicago Bulls, Indiana Pacers, Sacramento Kings, Houston Rockets, and currently, Los Angeles Lakers). He’s had a number of accolades during his career, too. 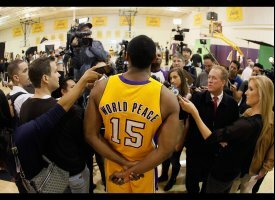 The thing that Artest will most be remembered for is what he did in September of 2011 — changed his name to Metta World Peace. In 1985, a football player decided he was going to make his nickname more official, so he changed his name from Mark Duper to Mark Super Duper. In 1981, a basketball player by the name of Lloyd B. Free changed his first name to World, making his name World B. Free. In 1971, another basketball player, this one by the name of Ferdinand Lewis Alcindor, Jr, decided to change his name. You’ll probably recognize him by the name he chose: Kareem Abdul-Jabbar. In 1964, a famous boxer by the name of Cassius Clay decided he was going to change his name to Muhammad Ali. As I said, World Peace and Ochocinco are certainly not the first athletes to change their name. Though, of the athletes I’ve mentioned only Super Duper seems to have made the change for ‘innocuous’ reasons. The other three (and World Peace) were making the change for religious reasons or because they were trying to make a point. There was another basketball player a couple of years ago who made the change so that he would be more accepted by the Japanese people (as he was immigrating there). A baseball player in the 2000s decided that there were one too many “Johan Santana’s,” so he changed his first name to Ervin. Maurice Jones’s grandfather, Drew, succeeded in his one goal: to see his grandson play through his first two seasons at UCLA. And after Drew suffered a fatal heart attack at the end of the second game of Maurice’s third season, the younger Jones altered the name on his jersey in tribute. This entry was posted in Sports and tagged Athlete Names, Athletes, Chad Johnson, Cincinnati Bengals, Kareem Abdul-Jabbar, Los Angeles Lakers, Mark Duper, Maurice Jones-Drew, Metta World Peace, Muhammad Ali, Name Changes, Perspective, Sacramento Kings, Super Duper, World B. Free, World Peace. Bookmark the permalink.